This homemade marinara sauce is easy to make in the crock pot and tastes better than anything you could buy at the store! How-to recipe video in the post! 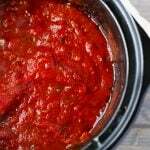 In a medium pot or dutch oven, pour in crushed tomatoes, tomato paste, and water. I just fill the empty tomato paste can up with water. Place the whole carrot in the sauce. In a sauté pan, heat oil until shimmering. Add the herbs and salt and cook a minute or two longer. Pour into sauce and stir to combine. Cook on low for at least an hour, preferably longer. You can simmer a pot on very low on the stovetop, or put it on the middle rack in a 275 degree F oven or cook it on low in the crock pot for up to 8 hours. Stir occasionally, especially if cooking on the stovetop. When finished cooking, remove the carrot and taste to adjust seasonings. The carrot is added to the sauce to tone down the acidity of the tomatoes. If you don't have a carrot, you can substitute adding 2-3 tablespoons of sugar. How much you use will depend on the canned product you use, or if you use fresh tomatoes. To make it into a meat sauce, I brown some ground beef or sausage or both before sautéing the onions. When it's almost browned, I sauté the onions, add the herbs, and continue on with the recipe. Additionally, if you have some sausage links, a chicken breast, a pork chop, really anything you can just stick that whole in the sauce after it's prepared and let it cook away. After it's done, I remove the meat, roughly chop it, and serve it with the sauce. It's really up to you. In the recipe I use canned crushed tomatoes, you can use plain tomato sauce or homemade crushed tomatoes. I love using fresh tomatoes from the garden! You'll want to blanch them, then peel them, then crush them or grind them. An immersion blender works really well for that job. If you'd like to use fresh herbs, omit adding any during the sauté step. Instead, chop them up finely and add them when the sauce is finished cooking, right before serving. Use double the amount of dried herbs listed in the recipe except for oregano. Fresh oregano can be overpowering, so add it sparingly and then taste to adjust. I like to cook my sauce in the crockpot on low for about 4 hours but you can leave it in the crockpot for up to 8. If you're cooking it on the stovetop or in the oven, be sure to check it frequently at the beginning of the cooking time to make sure the heat is correct and nothing is burning or getting to hot. Cook it for at least 1 hour this way, up to 4 hours.